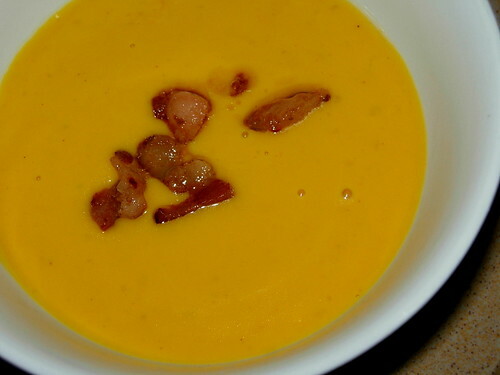 I read Wuching’s blog and notice how easy it is for Mrs. Wuching and him to make a pot of pumpkin soup. He got all the steps photographed so you can find the method there. However, I wasn’t sure if my soup will turn out fine and moreover, I was too busy dealing with the roast chicken feature in the previous post so I didn’t take any pictures. In fact, I was expecting disaster because it was an impromptu dish using whatever I can find in my fridge. Enough water to cover all the ingredients. You may end up with too much stock. Don’t use all of them or your soup will be too watery. 1) I boiled the pumpkin and carrot with the stock because I am a lazy bum. 2) Next, I took out the pumpkin and carrot pieces, put them into the blender and use only part of the stock. I go by testing the consistency of the soup. So, hard to tell how much stock I used. I blended the soften pumpkin and carrots. 3) I heat the piece of butter and put in the two tablespoons of wheat flour to make roux. This is the way to make soup thicker, i.e. heat the oil with flour till the flour turned transparent. Add a little stock and stir them till there are no lumps. 4) Pour in the blended mushy pumpkin and carrots. 6) Season with salt. I would avoid pepper at this stage so that there are no ugly black dots in the soup. You should get a nice, creamy soup. My hubby didn’t realized it is homemade. He thought it is from the canned version until he almost finished eating it. I take that as a compliment. LOL. I served the homemade pumpkin soup with bread and the roast chicken. My kids just love the creamy soup and I am so glad they gobbled up without realising those are carrots they are eating. If I mention the word carrot, they will probably refuse tasting. You can actually blend any kind of vegetables in this method and by following the same steps, you should get some form of creamy soup. The taste is good because I use whipping cream but you can substitute with low fat milk if you are afraid of the calories. Easy, right? You can impress your guest for Christmas with this soup. haha i thot someone skim my content when i got the link from this site so i deleted the link; didn’t know until now that its only my master! sorry ya but I cannot un-delete the link liao…your soup looks so much tastier leh with more ingredients, Terese see also jeles!